Of the American and British Armies in over 30 great battles of the American Revolutionary war. 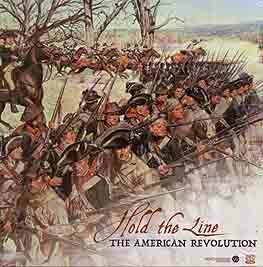 You'll feel the battles come to life as the American militia and Continentals face the feared British elites as each try to hold the line. As British leaders you've told the American patriots to lay down their weapons or you'll lay waste to their lands. As the Americans you have pledged your lives, fortunes and sacred honour in defence of all you value. Take the role of British generals Howe, Burgoyne, Cornwallis and others as you stake your reputation on defeating the rebel armies. And as American generals Washington, Greene, Gates and other you've precariously placed your army in their path where the outcome depends on your decisions... The enemy approaches, the sound of cannons deafens, men shout commands, smoke fills the air, can you HOLD THE LINE? The game is an update and remastering of the original HOLD THE LINE and CLASH FOR A CONTINENT updating the scenarios and adding many new ones. Using detailed plastic miniatures you'll get to command infantry, cavalry and artillery with their leaders. You'll get new innovative terrain pieces and megahexes as well so you can lay out the battles included or design your own.